More details are being made available regarding the embezzlement and money-laundering case against El Salvador's former president Tony Saca. El Salvador's attorney general announced that Saca and six others were being charged with the diversion of more than $246 million from the public coffers. The prosecutors uncovered a pattern of money laundering of funds coming out of various public accounts, through various other accounts, cash withdrawals, and other transfers leading, among other places, to accounts of media companies owned by Saca. The prosecution is being led by the Financial Investigation Unit and the Anti-Impunity Group of the Attorney General's office. The next hearing in the case is Thursday morning, November 3. Saca denies all of the charges against him. He continues in custody. His defense lawyer stated that the ex-president feels fine and has faith in the judicial system. Police also searched the home of the former president and some of his businesses in the past few days. The attorney general has also asked that funds in overseas accounts related to the accused officials be frozen. Meanwhile the corruption cases against Saca and others have produced a public spat between San Salvador's mayor, Nayib Bukele, and the country's attorney general Douglas Melendez. Bukele posted on his Facebook page his belief that the prosecutions by the Attorney General's office are part of a scheme to return ARENA to power in the country. His proof of this is the lack of prosecutions of current figures in ARENA. (Although Saca was a member of ARENA throughout his presidency, the scheme would be to eliminate him now that he is the leader of the GANA party). Melendez responded by asking that the mayor show prudence and respect for each one's respective institutional role. Melendez added that the mayor looked a little too nervous, perhaps because Bukele family businesses had received millions of dollars in public contracts. Bukele responded in turn that the attorney general should not be threatening him just because he exercised his freedom of expression and said that he would not be intimidated. 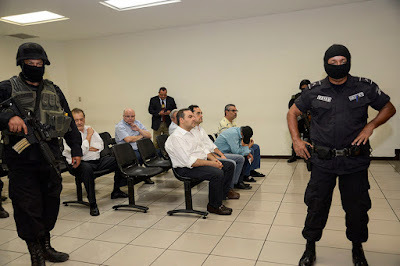 Politics and criminal prosecutions are a potent mixture in today's El Salvador. Sounds like another country where many Salvadorans live.